The Relative Strength Index (RSI) is an oscillator that compares the magnitude of recent gains to recent losses in an attempt to determine overbought and oversold conditions of an asset. The RSI ranges from 0 to 100. The RSI supports the traders to find an optimal time to enter a trade or take profits. 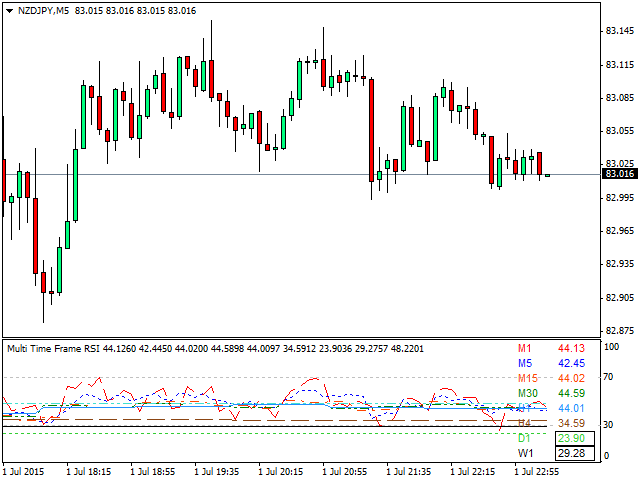 The Standard RSI of the MetaTrader 4 can only be displayed in one Time Frame at one time. To improve the hit rate of your trades (especially in lower time frames) the "RSI Multi Time Frame" will show all RSI Charts and values from all Time Frames.